Slips, trip and falls can lead to devastating personal injuries, and when these are someone else’s fault, the victim can make a personal injury compensation claim. 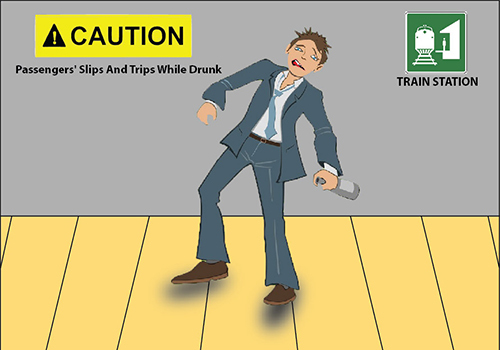 However, while obstructions in walkways, slippery floors and litter can all lead to slips and trips, and are regularly seen in public liability claims, a common factor in these incidents is alcohol. If you are intoxicated and are in a slip, trip or fall, you may find you are unable to claim compensation. You will have to be able to demonstrate that an individual or organisation acted in a negligent manner towards your personal safety and that this led to the incident; however you will be far more likely to fall over due to your own clumsiness if you are drunk. Network Rail has released a video warning people of the risks of using public transport while intoxicated, revealing that 112 people were injured between April 1st 2012 and March 31st 2013 within Manchester Piccadilly Station alone. The organisation manages 17 stations in the UK, and in that timeframe, slips and trips in these transport hubs saw dozens of abrasions, cuts and bruises, five concussions, 19 dislocations, 51 bone fractures and one death. The most dangerous train stations are Leeds, London Liverpool Street and London Paddington, with slip and trip risks including steps, escalators, lost luggage and the platform edge. Network Rail’s video features people slipping, tripping and falling due to their own negligence, including a man who attempts to kick a pigeon, misses and falls over, and a man falling down a set of escalator, being repeatedly dragged up and down them. The transport provider said nobody featured in the video suffered lasting personal injuries as a result of the slip or trip. It is hoped the video will encourage other members of the public to take care of themselves, watch their alcohol intake, and avoid slips and trips in railway stations. There are a number of inherent risks at railway stations, and the organisations that take care of them can strictly adhere to their health and safety policies, taking all reasonably practicable steps to control risks. While they can still fail in their duty of care to protect the public, and can find themselves liable in public liability claims following slips and trips at train stations, in a huge number of cases the injured party is deemed to be wholly responsible for their personal injuries. IF you have been injured in a slip or trip at a train station and you feel that the accident was caused by someone else’s negligence, you have the right to claim compensation. Our personal injury solicitors can help you receive all the money you are entitled to and give you the expert representation you need to claim against Network Rail or other transport service operators. Call us on 08000 430 430 or fill in our online enquiry form to get in touch with us and speak to an expert about your case.